I’d like to propose an alternative to the typical conference model. Chris Wejr got me thinking after he sent me a message suggesting that we host a conference sometime in 2013 that he called a ‘hybrid conference’ and this post by John Burk also influenced my thinking as well. Most conferences have no follow-up after the conference. Learning about ideas outside of our own personal areas of expertise, in other words, being pushed by others to improve ourselves. First, we would assign people to cohorts (based on their interests, or on questions they answer during registration) after they register, and setting up email lists (since most people are more comfortable with email than with other social media, and it would automatically provide records of the partiicpant conversations) for those cohorts, along with a facilitator for each cohort. The job of the facilitator is to provide information to the cohort about the conference coming up, and to encourage conversation and introductions between participants before the conference. These cohorts would also be sent links to video presentations (which should be broken into small chunks and include searchable transcripts of the video) that they can watch in advance of attending the conference. Ideally, presenters would be part of these cohorts. 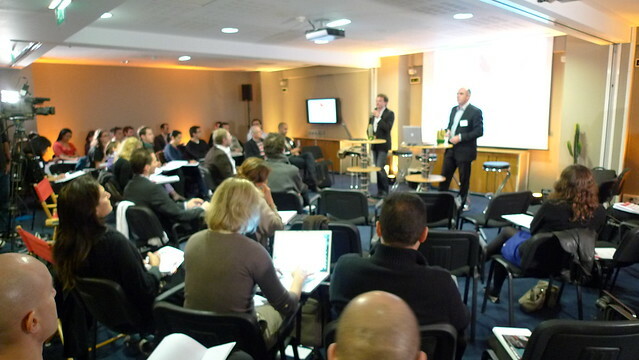 The people would then attend the conference, and potentially move around through their sessions (which would have to be scheduled in advance, like a typical conference, but with input from the registrations) as a cohort, with sufficient opportunities during the sessions to connect and discuss the ideas, or at least between sessions. Ideally each session would be run more like a workshop, rather than a lecture, since most (if not all) of the people in the cohort would have already listened to the presentation. In some of the more advanced sessions, participants would produce a product as a result of their time together. Social media could be used during the presentation as a back-channel, so that people from outside of the conference could learn from the participants, and share their ideas back to the conference. Naturally, most participants attending the conference would know some other people there. They would have conversations, and they could choose to eat together. Obviously, if one wanted to continue through the conference as a solo participant, this would still be supported by this model, one would just choose not to interact with their given cohort. After the conference, the cohort email lists could be used for follow-up, as well as other social media. People would be expected to continue to ask questions and discuss ideas, as well as share their successes (and failures) back to the group after attempting to implement whatever strategies, techniques, or resources they learned about through the conference. Provided the participants made the effort to seek follow-up, they would have an avenue to receive it. This conference format would help mitigate some of the problems with the typical conference format, while not taking away any of the benefits. It would further have the benefit of allowing people who could not afford to attend the conference in person to still participate in many meaningful activities related to the conference itself. It would definitely require more work from participants than is typically expected for a conference, and I’m sure this would turn some people away from attending this conference. That being said, those people I think rarely get very much out of typical conferences anyway, and I’d rather not build a new conference model based on the lowest common denominator. Do you see any flaws with this model? Can you think of any ways of improving it? What you outline is a wonderful innovation. None of it would have been possible a few years ago. The same ideas can be used in settings other than conferences. Any professional development format or even teaching formats at various levels could use the interactive aspects that you propose. The feedback loops before and after the interactive sessions and the ongoing nature of the interactions would be such an enhancement. This is a great model for conferences. The many I have attended have pockets of people using laptops/tablets during sessions recording ideas or social media like Twitter randomly point observations. What these people lack is a coordinated effort to get the most out of the work they are putting in. ( I went to one ICT conference last year that had a wiki and Twitter feed set up on the day – would have been better to know this before the event). Too many conferences come and go without true reflection and feedback from participants. This would be a great way to go. it’s something I’m attempting at my own school for staff meetings I personally orgsnise to show over leaders how we can use ICT to enhance our meetings. My name is Eleanor Pomerat. I am a student in Dr. Strange’s EDM 310 class at the University of South Alabama. I will post a summary of of the comments that I have left for you to my blog before 4/2. I was very interested to read your thoughts on changing the way conferences work. I’ve heard of using twitter during a session; someone asking for responses by tweet and such, but that’s a very limited use of technology and doesn’t really bring people together with a sense of community, as conferences are really meant to. I agree that email is the best option currently available that is widely used and accepted by all ages. With that said, I think that email will become a sort of dinosaur for the next generation, who are currently shying away from it. I say this as a member of this younger generation. I don’t have a perfect solution, but I think the perfect kind of new technology would mesh the community side of Facebook with the professional side of email. This new interface would need to be carefully set up to allow for archiving, but also for interactive activities within a session. Do you know of something that is currently available that is a cross between facebook, email, and a forum? I think that would be the very best option. I really enjoyed reading your post and hope that this kind of conference come to fruition; it’s a wonderful idea. Hey David – thanks for taking my questions/thoughts and expanding and challenging me. I think the key is creatig the conditions for those who want to have a significantly better conference experience – having this as an option for partipants could be huge as then it moves away from the “sit and get” one time PD model to more ongoing, collaborative model. I am equally a Mathematics teacher with a Masters degree in Measurement & Evaluation and also a Doctoral student. I totally agree with you and Chris that the traditional conference needs to be rethink. Having participated in two EdCamps, I felt so energized, meet so many wonderful people and had real conversation with them. This is something that doesn’t happen as easily in traditional conference. Now if I go to a traditionnal conference, I try to present there myself because it put me in a position of creating conversation instead of just receiving information. In that way you also get to meet people. Otherwise, it can sometime be a lonely experience to go to a traditional conference. I also had the idea of creating presentation about EdCamps and create mini EdCamps session within the workshop allotted time. Thus, people participating in the workshop can actually have a small experience of it and bring it home with them, and maybe, find the inspiration of organizing they own EdCamps. I really like what you’re suggesting. It looks like an idea I had of organizing study group in my school, but instead applied to a conference model. I’d like to offer my help organizing your new conference model. Keep me in the loop if you’re going forward with it. Loving your thoughts and comments on this post and others I have read from you – especially your apprenticeship model for teaching http://bit.ly/I4hwLi. In your post I hear you questioning the value/richness a traditional PD conference offers its participants as compared to the enhanced opportunities offered in your PD model. Your model has more to offer because of what collaboration does to an educator’s creativity and commitment to their craft & students. You are preaching to the choir here – I have drunken the juice – I agree completely with your model. I saw a small glimpse of this model this past month when I had the honour of sharing a lead role in putting on this conference http://www.bctc2012.wikispaces.com. Our goal was to model what is happening in progressive classrooms – student centred – and to get away from the traditional conference full of what many 21st century educators call bad teaching – chalk talk with zero interaction. So, we tried to use the wiki in advance, tried to use hashtags for everything, and tried to build time in the day for short bursts of sessions with networking time. Although it was a one-day conference, I can appreciate your model of meeting in advance because I was in contact with many of the presenters and delegates attending. The largest issue/piece/angle/topic that I see separating these two models of PD is this: With respect to the educators coming for PD, how open are they to this new model? What I’m really asking is this: are educators in 2012 genuinely open to networking with others? If they are truly open to that then I believe they will be open to the new vast ways to network (read learn) – social media – and will be open to trying new pedagogy in their teaching. If on the other hand, they are not open to collaboration (read leave me alone to teach my lessons), then I believe this new model of PD will be very, very threatening and will make these educators feel very uncomfortable. I keep hearing about EdCamps…still looking to get into my first one. These un-conferences are exactly what conferences need – short bursts of info with lots of processing/practicing/networking time.